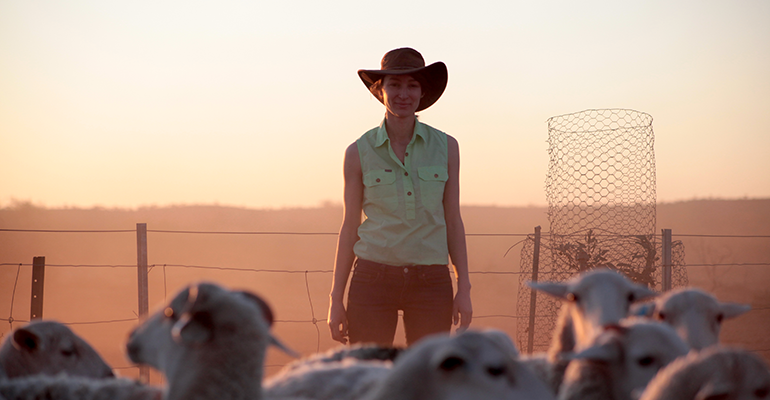 Anika Molesworth is not your ordinary farmer. 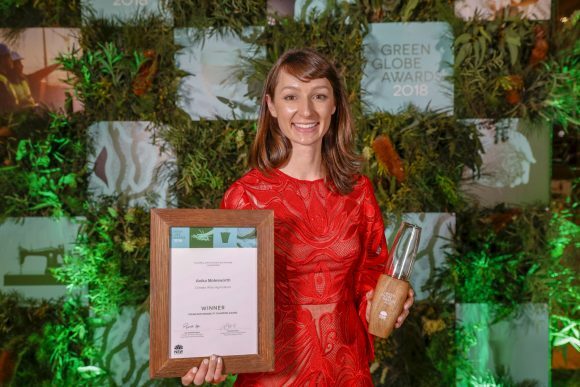 Founder of Climate Wise Agriculture, and board member of Farmers for Climate Action, she’s on a mission to change the future of farming through sustainable practices, and fighting the endless battle making people take climate change seriously. She’s this week’s changemaker. Five millimetres of rain doesn’t seem like much. But when the land is so parched and dried out, and livestock are dying of thirst and hunger, holding onto the hope of that five millimetres forecast for next week is all you have. When Molesworth’s family bought a sheep station in Broken Hill back in 2000, they didn’t know they were entering into the worst recorded drought since European settlement. She slowly watched the dams dry up and the shops in town sold, as people gave up hope anything would ever change. 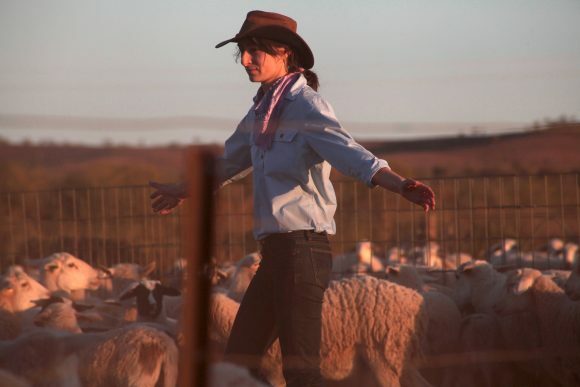 She also knew that this was not a natural occurrence, and that the farming community needed to band together to advocate for serious climate action, and educate farmers on a more sustainable future. 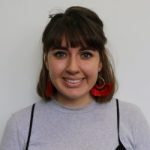 In this week’s changemaker, Molesworth discusses her frustration over climate sceptics, the importance of positive attitude in desperate times, and the bright future of farming. Your parents bought the sheep farm at the very beginning of the millennium drought, how tough was that? We moved to Broken Hill when I was 12, from Melbourne. I was so excited because I absolutely loved the outdoors, but the year 2000 happened to also be the start of the decade-long drought. Our introduction to farming was a pretty steep learning curve because for those first 10 years, it pretty much didn’t rain. It was really hard to watch the farm and community go down hill year after year, because the extremity of the drought’s length really took a toll. Was there a particular moment when you knew it was getting really bad? The difficult thing about a drought is it’s such a prolonged process. The rain stops falling, all the water from your dams evaporates, and you’re left with these mud stink holes which your animals get bogged in, and you’re trying to drag them out. The livestock are also becoming very hungry, and very desperate for water, so you see it having an impact on the wildlife and livestock quickly. In the end, we made a decision to sell our livestock, which is always a hard decision for a farmer because that’s your business, and you breed up your stock over many years. You just don’t know when it is going to end. Unlike a bush fire or a flood, which happens rapidly, and of course it’s a terrible event, but you start rebuilding very quickly. With a drought, there is no end in sight and you just have to keep hanging on to hope, that maybe tomorrow, maybe next week it will rain. How did the conversations you had with people in Broken Hill change since the drought started? When you’re not in a drought, you’re talking about a whole range of things; sporting events community events and what’s going on in daily life. When you’re in a drought everyone feels it, and carries that weight and that’s all you talk about. It feels like an emergency, and you have to think, okay, how are we going to look after each other. I think people become quite obsessed, constantly checking the weather forecast, and hanging on to hope that that five millimetres next week will actually eventuate, and so often, it doesn’t. But the thought of having it there on the computer screen or on the newspapers saying there is the prospect of rain, that’s what people really hang onto. It sounds so minimal and so unimportant, but when you’ve got nothing that’s all you can hold onto. When did you decide you were going to try and make a change in agriculture? Growing up surrounded by drought really made me stop and think that if I’m actually going to have the future that I dream of in the agriculture industry, there are some huge challenges coming up in front of me. I set about learning agriculture in a wider context of the rapidly growing global population, how we were going to reduce our environmental footprint, and how we could up skill the next generation of farmers who are going to be facing these challenges at a greater extremity than ever before. Do you think the government funding given to farmers recently has been funnelled into the right areas to make lasting change? A lot of the assistance packages are focused on the now. How do we get people through this drought, how do we get mental health professionals out in these communities, how do we get feed to the livestock so they’re not going hungry. It’s an emergency situation, so what these packages are looking at are how they help people immediately with a band-aid type fix. What I’m really focused on is the longer term solutions and strategies that need to be put in place, because the science is saying that droughts will become more frequent and more intense. We need to produce more food because of the rapidly growing population. We know we’ve got finite natural resources here. We’ve got a scarcity of water in Australia, and really infertile soil, so there are a lot of challenges. We need to focus on learning things from the drought so when the next one comes, we are better prepared. Do you find it hard to talk to farmers about the future when it’s already so hard for them? You have to be conscious that it’s a really bad time out there, but I don’t think it’s helpful to be focussing on how bad the drought is, because farmers know that, they feel it and they see it every single day. So actually keeping our eyes on the horizon is so important. We need to be thinking about, what we’re learning, what we can do differently next time, and how we can talk with the policy makers and say this is what we’ve learnt up until now, this is what we need to do going forward. I think farmers are really good at that. They’re always thinking about what they’re going to plant next season or how can we manage water resources better. I think what we’re seeing changing now is that business as usual no longer works. The environment has changed so rapidly that we actually need greater support from people out there. Do you engage other sectors in this issue to help? Definitely, this is not a problem that can be tackled in isolation. We need people from a whole range of industries, who can bring a whole range of perspectives, skills and knowledge to the discussion table. Climate change affects every component of society as well as farming, I mean it’s the food, it’s the water, it’s the economics of social stability. It’s all inter-connected. In my work at Climatewise Agriculture, and Farmers for Climate Action I’ve really been looking at how we engage people from across sectors, and how we can have agricultural climate scientists, farmers and business people sitting down with politicians and knocking out these problems together. As part of your PhD, you’ve got crop trials in NSW, what are you trying to achieve with them and do you know how will this reshape the industry? I’m looking at how to better recycle and revalue agricultural products, to improve soil fertility and crop production. That includes looking at crop residues, livestock manure and how we actually recycle the nutrients which are already in the system. I’m doing cotton trials in Griffith, and maize trials over in Cambodia. They are two farming systems at completely opposite ends of the spectrum in terms of technology available, access to information, and different land types, but it’s giving me a good understanding of how different crops work all over the world. Have you seen a shift toward sustainable farming practices? I think farmers are an incredibly adaptive, resilient breed of people, and I think they do their very best to keep abreast of new technologies and new information. So a lot of the agricultural industry run information workshops, conferences and release reports, which farmers take part in to update their practices. I think we’re always going to be moving in a direction where we do become more resilient and sustainable and better our efficiency with resources, because we are always gaining new information to be more understanding of how our world works and the human interaction with it. Farmers have a strong voice within the community, do you think that voice will be strong enough to make politicians commit to real climate action? We need to be part of the discussion, but so should everyone, because climate change impacts everyone. We all need to be engaged in this topic and bring our own perspectives and skills to the table so we can work on these strategies and actually meet with more people. I do know we urgently need action, because the effects are being felt right now. With the upcoming federal election are you ramping up your efforts to encourage parties across the board to have a serious stance on climate change? Well look I think all parties do need a serious stance on climate change and for the politicians in the party who say they back rural Australia, they need to take action, because standing up for rural Australia means standing up for climate action. Changes to the environment are happening so rapidly, and farmers are trying to make changes in their businesses, but they can only do so much. Hopefully the politicians are listening to us, because our voices will only becoming louder and louder as conditions become more challenging. What frustrates you the most when you talk about climate change with people? I get a bit irritated when I do an interview and the question is whether or not I believe in climate change. I just don’t understand why we need to debate that idea, and throw another log on the climate change fire, instead of focusing on the solutions and the future. What I’m really interested in, is equipping the next generation of food and fibre producers with the skills and the knowledge to adapt to these changes and to thrive in this industry. I think there are some great hurdles being presented to the young farmers and they need to be part of designing strategies for the future, because we truly have a vested interest in designing a sustainable and resilient farming system for all of us. I’m involved with a few young farming groups and these groups are doing such incredible things. There’s just such a powerful force of young people in agriculture wanting to be change makers. When people realise how dynamic and how exciting agriculture is they do want to get engaged. For instance, I’m flying drones to monitor the health of my crops, and then you step into a tractor and it’s five monitor screens and a DVD player while the tractor drives itself, which is pretty cool. What are some of the things that motivate you to keep going? Rural Australia is incredibly beautiful. There are vibrant communities which feel like a big family, and you’re doing something so rewarding, actually growing food to feed people, and growing fibre to clothe people. And for me there’s a great sense of joy to be a part of that. You have a really positive attitude, but what’s the one thing that keeps you awake at night? On my family property, we have a number of rare and threatened species, which we are starting to find dead and shrivelled up in summer. We have these desiccated desert lizards, who have evolved over a millennia to be the arid historians of Australia, and we’re finding them parched and dead in the landscape, because it’s too hot. We’re measuring open ground temperatures of 70 degrees on our farm. What grass species or small mammal can survive at ground level in 70 degree heat? We’ve got 800 year old gum trees which are dying, and can’t germinate anymore. These are changes that are irreversible, and I’ll see these species lost, within my lifetime, possibly even within my parents lifetime, and I feel a huge sense of responsibility over that. We are all part of creating that environment which we’re seeing this drastic loss of biodiversity, where our ecological systems are literally breaking down front of us. So yeah, I guess that’s what keeps me awake at night. That’s why I really do everything I can to speak about climate change to empower young people to be part of the conversations, to be engaged with these issues because we really need to be shouting it from the rooftops that change needs to happen, and it needs to happen urgently.